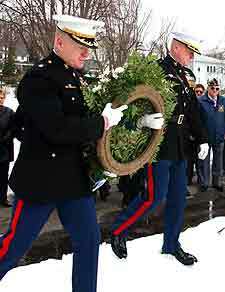 More than 25 years have passed since Lieutenant Colonel Robert J. Theilmann moved away from East Northport, New York. But judging from the attendance at a memorial service yesterday, as well as the words spoken about him, it was as if he'd never left. Those who had gathered at St. Anthony of Padua Roman Catholic Church remembered the beginning of Theilmann's life, which was filled with baseball games and studies at the grammar school right next door. And, with Theilmann's cousin, the Rev. Michael Marigliano presiding, they also remembered the end. 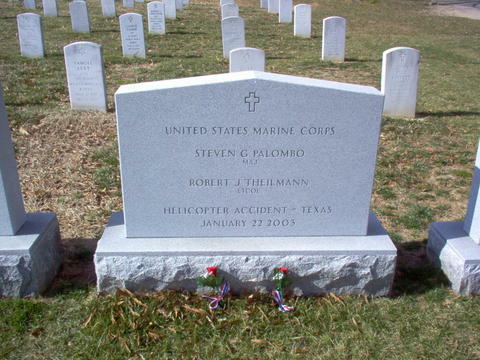 That came on January 22, 2003, when the helicopter the 47-year-old Marine was most likely flying collided with another AH-1W Super Cobra somewhere in the sky over Zapata, Texas, while on a anti-drug reconnaissance mission. He lived in Oceanside, California, with his wife, Barbara. "So little remains,” said his older brother Richard of Astoria. "There's nothing but ashes left. It's as if the Lord came and took four guys out of the sky. They can't explain it.” Indeed, what is left from the wreckage is the tail rotor of Theilmann's helicopter, he said, and part of the fuselage panel and the tail from the other. As a tribute, the names of the three others who died with Theilmann that day were read. 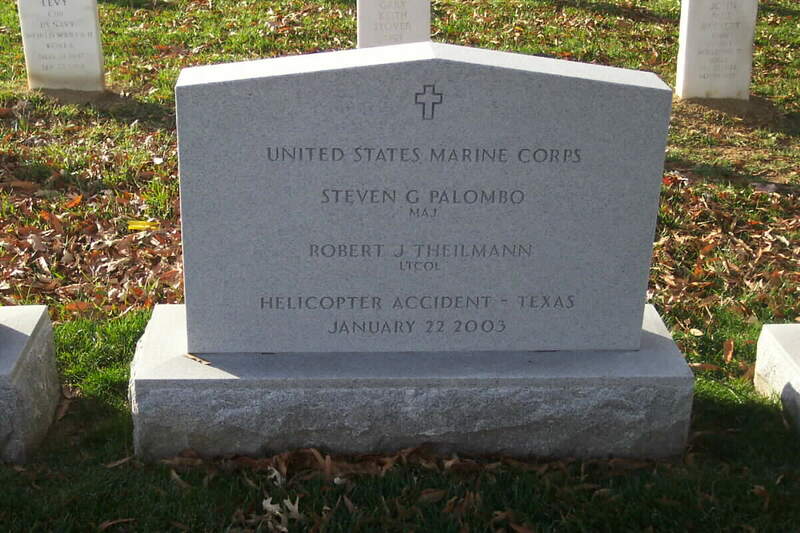 They were Major John M. Walsh, Captain David C. Cross and Major Steven G. Palombo. Since their ashes are intermingled, they will be buried together on March 6 in Arlington National Cemetery with full military honors. "We celebrate Robert not as a victim of a horrendous accident, but as an author of a life,” Marigliano said in his sermon. Theilmann's life was one penned around service, his family said; and a passion for what he did. That week it was working with the border patrol, searching for people, and drugs, crossing the U.S.-Mexico border. Just the night before he and the others died, they had a successful mission. They had stopped seven people and 35,000 pounds of marijuana, said the commanding officer of his unit, Colonel William Liston. "He epitomized the character of a Marine,” Liston said. "We loved him, and he'll be missed.”After the service, a procession of American legion members, friends, family and fellow Marines laid wreaths at Northport Village Park to remember Theilmann, who had four brothers.